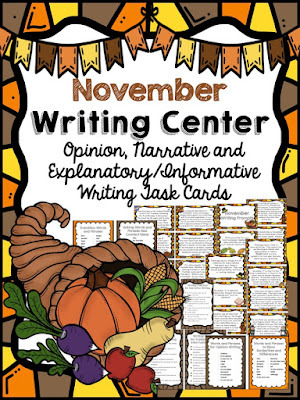 The Best of Teacher Entrepreneurs: Language Arts - "November Writing Center"
Get your students writing with these fun and engaging November writing prompts. All you need for your writing center is included! These writing prompt task cards cover Opinion/Persuasive Writing, Explanatory Writing, Narrative Writing and also incorporate some letter writing.